By sideslipping a number of projects into the boatyard at one time, projects are quite literally run along side one another. This has meant that those working on projects to a tight budget can get on with the more repetitive tasks themselves, whilst having the bonus of professional help and extensive equiptment available on site for complicated tasks. Although this may prolong the length of time that the project takes, it develops a self sufficiency and confidence that is helpful in the ownership of a wooden boat. There is also plenty of helpful advice from people who have successfully completed their restoration projects. We all need a bit of professional help from time to time, and by far the quickest way to complete the work on your boat is to set up a schedule for the restoration of your boat with the people at the yard. However, if you are doing some of the work yourself, you will probably require a few sessions from some helpers and the on site steam box, which at the push of a button produces steam in under 7 minutes. 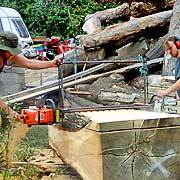 You might also need a hand cutting a slab of wood from a crook you have spotted in the wood pile and if you haven't done any caulking before then you might need some help to get started. The deadline of an approaching launch day is a great incentive to get a boat to a point of completion or at least a waterworthy state. With a traditional side launch as a grand finale to all that hard work, the big splash is an excellent way to return your boat back to the water. In addition to all our boat restoration facilities, we also have 240v mains power and water on site. Two new large workshops are currently under construction at the boatyard. 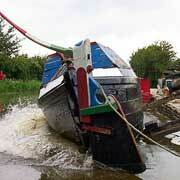 Smaller boats under thirty five foot and three and a half tonnes can be lifted on site. 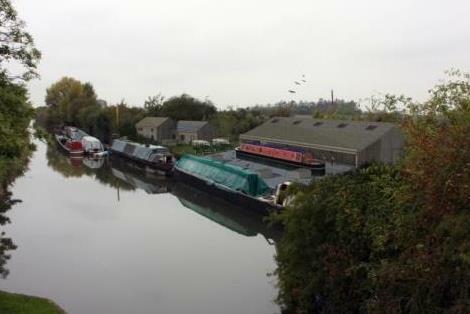 Bates Boatyard is located on the Aylesbury arm of the Grand Union Canal.